The RAYM2-24-58 range has been designed as a cost effective solution for telematics / asset tracking applications MiMo WIFI. The compact, robust low-profile housing contains two elements providing MiMo WiFi 2.4/5.0GHz coverage. The antenna can be fitted on or under a vehicle dashboard or on a windshield using the supplied acrylic adhesive sealing pad. Supplied with integrated 3m (10’) cables which are compliant with UN ECE 118.01 and fitted with Rev Pol SMA Plug connectors, the antenna will offer plug and play connectivity with many different devices. 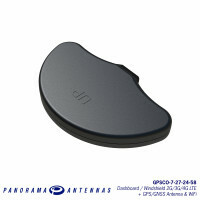 The GPSCO-7-27-24-58 range has been designed as a cost effective solution for telematics / asset tra.. 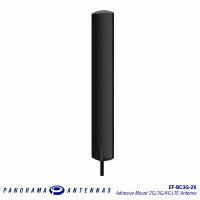 The Panorama EF-BC3G-26 range of antennas are designed to decrease the lifetime cost of M2M and smar..
With up to three omni-directional dual band WIFI elements in a single housing, the LPM /LGM ser..